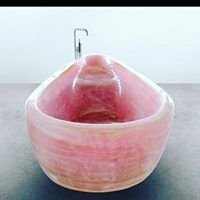 I have always been intrigued with the way crystals form and how beautiful they are, but imagine my amazement when I came across a picture of a bath made from Rose Quartz! 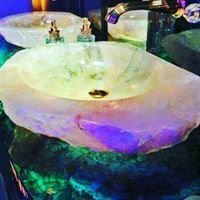 I was hooked on finding the most incredible interior design ideas using gemstones and crystals and the potential to change the whole ambience of a home. Isn't that beautiful! I would refuse to get out of it! and the most gorgeous thing about it is that Rose Quartz is known as the 'love stone' but it also balances yin and yang, restoring harmony after emotional wounding... perfect for a bath. 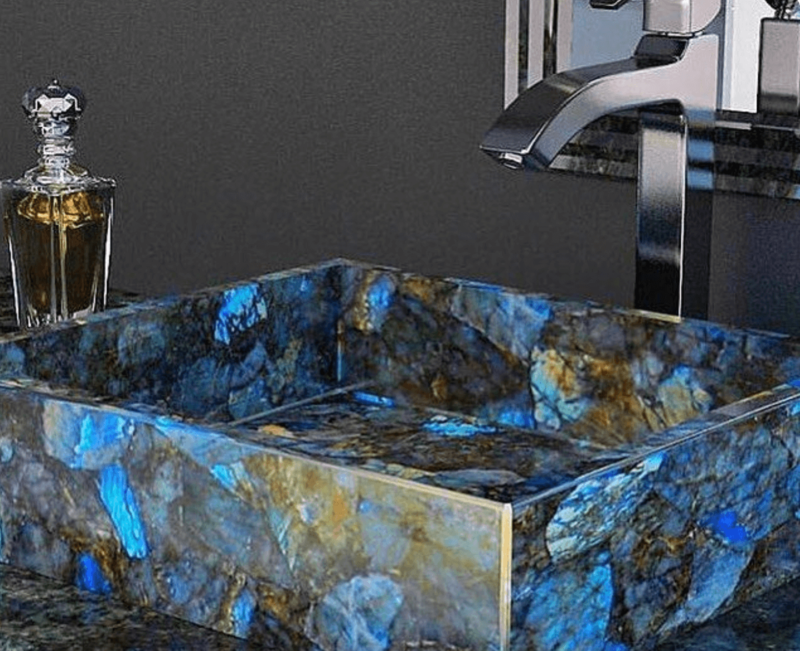 This is a picture of a labradorite sink! look at those fabulous blue flashes!! mesmerising isn't it! and labradorite is a crystal used to protect against negativity and it brings a sense of excitement and adventure! this would be the perfect hotel room sink! Although I could go on and on about lots of different crystal bathroom and kitchen fittings (there are some awesome worktops out there! 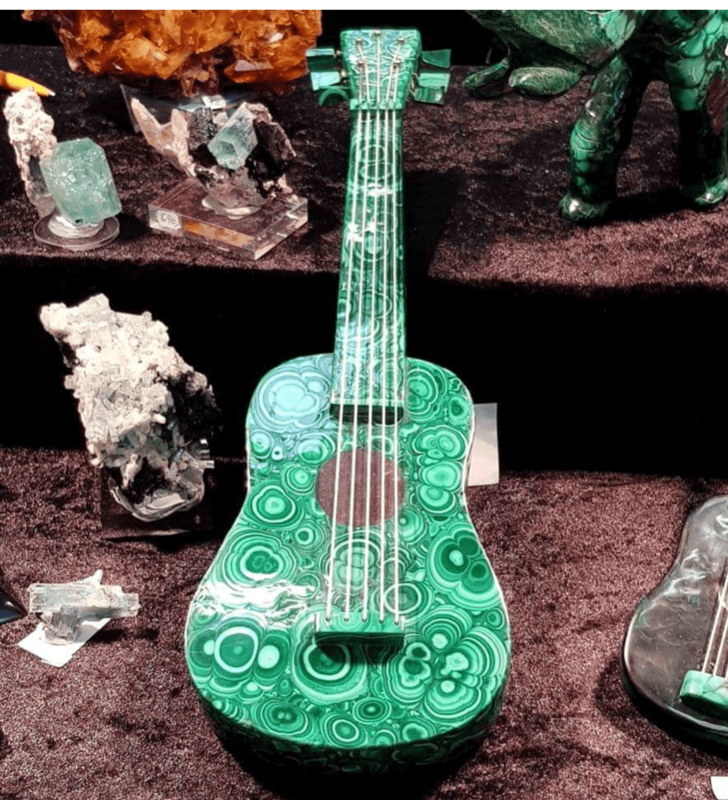 I also want to show you how some gemstones and crystals are used in every day items such as this guitar! it is made from Malachtite which is known to bring wealth, beauty and individuality! this was something which was thought about very carefully and not just a random choice, this is certainly a thing of beauty, it actually makes me want to take up lessons! How about the exterior of your home? 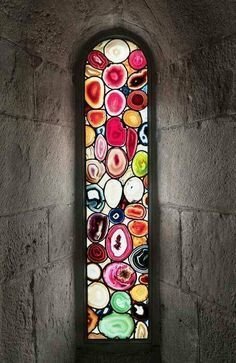 this is a window made from individual agate slices! by grouping them altogether like this it created this superb almost stained glass style window which is that little bit special! isn't it just stunning! and again the thought process behind using agate is not a random one, the ancient Chinese believed that agate crystal was used for spiritual protection and could stimulate one's life force while cleansing their mind to make space for good luck and fortune! the perfect window to a home. 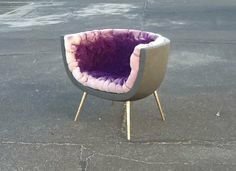 Lastly, check out this exquisite amethyst chair! I wouldn't get any work done if I had this (although I can't imagine it would be that comfortable!) but you have to admire it's beauty! and amethyst gives healing on all levels - body, mind and spirit! it raises vibrational frequency and protects against negative energies! the perfect crystal to make as a chair! Mother Nature is incredible, it's actually hard to believe that so much beauty can come from our planet, I will never get bored with collecting or examining crystals, they are just a natural wonder.